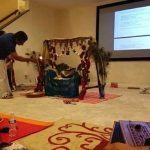 On November 13th, the Vishnu Sahasranama group at Faxon Commons apartment community in Quincy celebrated its 1 year anniversary at the residence of Mr. Selvam and Mrs. Sathya Selvam with Akhanda Nama Sankirtan and Vishnu Sahasranamam. 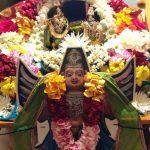 Many devotees participated in the 3-hour Akhanda Mahamantra Kirtan which was followed by Vishnu Sahasranamam and Hanuman Chalisa. Sri Ramanujamji was invited as a special guest to the event. 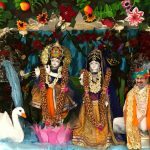 In his discourse, Sri Ramanujamji gave a beautiful explanation of the circumstances after the Mahabharatha War that led to Vishnu Sahasranama recitation by Bhishma. 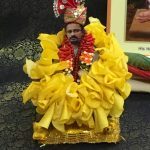 He spoke on the greatness of Vishnu Sahasranama underling the importance of chanting the Divine Names and said that one would get anything and everything by merely reciting these thousand Divine Names. 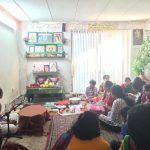 He applauded the sincerity of all the participants who regularly get together to recite the Sahasranama and encouraged them to continue this divine endeavor. 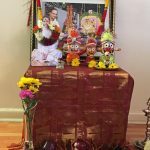 Being the special day of Deepavali and the evening time Goddess Lakshmi is worshiped, Sri Ramanujamji led a mass prayer session to Ashta Lakshmi to bestow all sorts of wealth and auspiciousness to everyone in the Vishnu Sahasranama group. The Vishnu Sahasranama group was also given a name during this satsang – ‘Sri Premika Varadhan Sahasranama Parayana Mandali’. Kumkum prasad and food prasad was distributed to all the devotees.